I've just discovered the website Baobella Boutique, a discount online beauty store that I'm pretty excited about! If you haven't already figured out I like to shop, I especially like to shop for beauty products and quite often go out to buy one thing and come home with about 20 things! Now when it comes to online shopping things get a bit more dangerous. So when I find a website that I can buy highend products at a discount price then I'm all over it and there is honestly no turning back, which will result in my bank account will be taking a heavy hit! 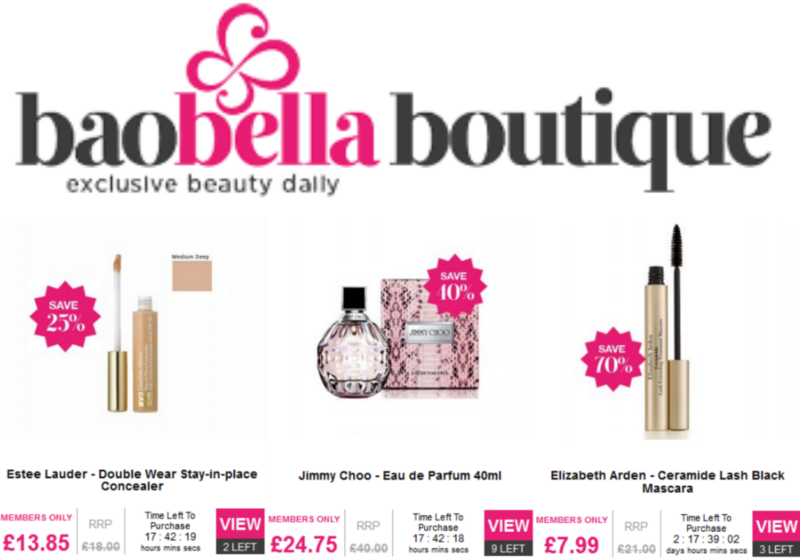 Now Baobella Boutique is totally different to any other beauty website that I've seen before. Firstly you need to become a member to take advantage of the discounts, but don't worry membership is free and it literally took me less than 60 seconds to sign up. New discount deals go up every single day at Midnight and discounts range from anything up to 80% off! Each deal or promotion lasts for 72 hours but there is limited amount of stock so if you have your eye on a highend product that's heavily discounted then get in there quick and buy it before they sell out! That's it, it's as simple as that! The good thing is next to each product it actually tells you how many of each is left when there is little stock left. They stock brands from St.Tropez, Elizabeth Arden, Estee Lauder, Shiseido , Essie and loads more brands. I just went on and managed to pick up an Estee Lauder Doublewear Concealer, an Essie Nail polish, and a Maybelline makeup set and saved a lot! What are your favourite websites to order your beauty products from? Do you use any other websites similar to Baobella Boutique?